After the horrors that went before, good news came just the next day. 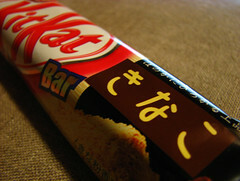 Only the best KitKat Bar (or Chunky KitKat) ever, that’s what! Kinako is toasted soy flour and… I know, I’m not usually that taken with it myself when it comes as a coating on traditional gloopy gelatinous sweets. But it has a nice rich toasted nutty flavour, and while I don’t necessarily fancy a mouthful of floury kinako, a mouthful of kinako-flavoured KitKat is wonderful. Even better than the original. And it seems like we don’t get to say that very often these days. This entry was posted in Uncategorized and tagged きっとかつ, きなこ, キットカット, チョコ, チョコレート, バー, bar, biscuit, chocolate, cookie, japan, kinako, kit kat, kitkat, 日本. Bookmark the permalink. sooooooooooo radicall can’t wait to taste i love prettyprettyumyum soooooooooo much they should do a big feacher page on hello kitty i know they already have but they need to do another NOW!